Is Congressman Peter Welch (D-Vt.) to blame for sicking the Internal Revenue Service dogs on conservative political groups and launching a national scandal? That's the impression one might have gotten from watching a WCAX report Wednesday night examining a letter Welch sent the IRS in March 2012. Introducing the story, WCAX anchor Kristin Kelly promises serious drama, saying Welch "is now feeling some heat" from a scandal that's rocked the Obama administration and already claimed the jobs of at least two top IRS officials. Senior political reporter Kristin Carlson takes it from there. "The fallout hitting the White House has also reached Congressman Peter Welch," she reports. "Some conservative critics charge he encouraged the IRS to do what so many are angry about now." "In a press release last year announcing he sent letters to the IRS and president," Carlson says, "Welch encouraged the IRS to, quote, 'investigate whether nonprofit 501(c)(4) organizations affiliated with Super PACs — such as Crossroads GPS, the Karl Rove-backed group... are in violation.'" Wait a second. Welch specifically called on the IRS to investigate Crossroads GPS? In the letter Welch wrote and 31 of his colleagues signed, the Vermont congressman asks the IRS "to investigate whether any groups qualifying as social welfare organizations... are improperly engaged in political activity." Like many at the time, Welch wanted to ensure that politically active super PACs weren't benefiting from the tax advantages and donor anonymity conferred upon traditional nonprofits. But nowhere in his letter to the IRS does Welch single out a specific group or political persuasion. So what's the WCAX report talking about? That would be a press release Welch's office sent reporters trying to drum up coverage of his letter. In the release, from which Carlson quotes in her story, Welch's spokesman cites the conservative Crossroads GPS as an example of the sort of groups that merit more scrutiny. To Welch, there's a big difference between mentioning a group in a press release and calling on the IRS to investigate it. "In my advocacy to the IRS, we were very careful not to specify any individual names, because it's not for me to tell the IRS what specific investigations they should pursue," Welch tells Seven Days. "But it's within my area of responsibility to advocate that a governmental agency do its job. I would never tell them, quote, 'who to investigate.'" Welch says liberal super PACs like Priorities USA, which was founded by former Obama administration staffers, deserve just as much scrutiny as Rove's group. What's important, he says, is not which groups are bending tax laws, but that those laws are being bent. Nevertheless, does Welch regret singling out Crossroads GPS in his press release — if not in his letter? "I don't," Welch says, noting that Rove's group certainly is an example of a super PAC benefiting from its nonprofit status. "My letter has to be judged on what's in the content of the letter. When you read the letter, it's very clear that it's not specific." But that's not stopping "some conservative critics" from crying foul, according to the WCAX story. That would be Rob Roper, president of the conservative Ethan Allen Institute and former chairman of the Vermont Republican Party, who appears in the story as Welch's lone critic. Calling it "incredibly poor judgment on the part of Congressman Welch," Roper says, "If his letter really is the first domino that caused all these actions to occur, I think it's a really big deal." Indeed. But as Carlson herself rightly notes in the story, the IRS' targeting of conservative groups began two years before Welch sent his letter. As several news organizations have reported, the IRS began singling out tea party-affiliated groups for scrutiny as early as March 2010. A report issued earlier this week by the Department of the Treasury's inspector general found that the IRS began developing its "Be On the Look Out" list in May 2010. Welch didn't send his letter until March 2012. Furthermore, the inspector general's report appears to exonerate outside entities — including, presumably, members of Congress — from responsibility for the witch hunt. IRS officials "stated that the criteria were not influenced by any individual or organization outside the IRS," the report says. What does Roper say to all that? Reached Thursday, Roper claimed his comments were taken out of context by WCAX. He says he added an important caveat to his contention that if Welch's letter was "the first domino" to fall that it'd be "a really big deal" — but that the caveat didn't quite make it on-air. "The part that [Carlson] cut out was the second half of that thought, which is, 'But there's no evidence that that's the case,'" Roper says. "So I just feel like she was just trying to get a big conflict thing there." The way Roper sees it, the IRS's targeting of conservative groups is, indeed, "a horrific abuse of power." But he says Welch's letter seems reasonable — and believes Welch was just doing his job. "Asking an agency that is charged with enforcing the law to enforce the law, where he thinks it's being violated, I don't see the problem," Roper now says. For her part, Carlson says she stands by her report and doesn't believe she took anything out of context. "The whole real point of this story is to inform people what the [Vermont congressional] delegation is up to," Carlson explains. "It's a huge national story and Welch is on the committee looking into this." The problem, perhaps, is a matter of emphasis and innuendo. Carlson and the anchors who introduce her piece repeatedly refer to a mounting backlash against Welch for his purported role in the scandal, when the only one who seems worked up about it is Roper — and even he now claims he's not all that worked up about it. More problematic is the manner in which Carlson glides over the fact that Welch never actually mentioned Crossroads GPS in his letter to the IRS — and that it was written long after the problems at the IRS started. It's as if those two facts are merely details, when in actuality they are the very point. 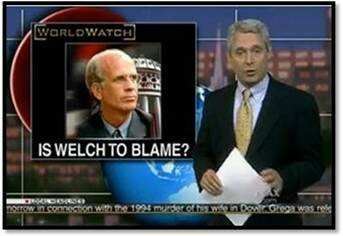 How Welch could in any way be culpable for the IRS' failings is unclear. Are we to believe that those IRS employees hopped into a time machine, traveled two years into the future and took their orders from a Welch press release? WCAX doesn't say, but we think that's unlikely. Double disclosure: Paul Heintz worked as Peter Welch’s communications director from November 2008 to March 2011. And WCAX is a media partner of Seven Days.